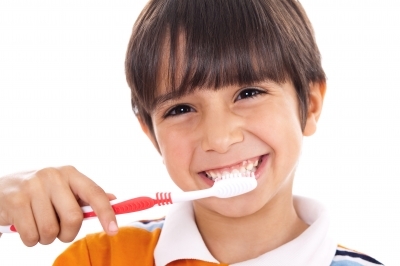 Follow these eight tips to safe, healthy tooth brushing for sparkling white teeth! 1. Choose a toothbrush with soft nylon bristles and a head that is small enough to reach all of the teeth in the back of your mouth. 2. Use only a pea-sized amount of toothpaste. Using too much creates over-sudsing, forcing you to spit too soon, or encourages you to swallow toothpaste, which should be avoided. 3. Angle the toothbrush perpendicular to your teeth and brush in a gentle circular motion. Brushing in a flat line causes gum damage over time. 4. Don’t brush too hard! Over-brushing wears away at the enamel of your teeth and can cause gum damage. 5. Be sure to brush the outside, inside, and top of your teeth. 6. Make sure you deal with easy to miss spots like the back molars and the inside of your front teeth. 7. Change your toothbrush every 3 to 4 months. 8. Come in for a dental cleaning and checkup every six months.